Her Majesty the Queen has today, Wednesday 5 December 2018, officially opened a new building at Coram’s central London campus dedicated to children and named in her honour - The Queen Elizabeth II Centre. The Queen Elizabeth II Centre is dedicated to the promotion of children’s rights and best practice. The new building is located in the heart of Coram’s historical site and is a celebration of the 350th anniversary of the birth of the charity’s founder, Thomas Coram. Thomas Coram refused to look away from children abandoned on the streets of London and campaigned for 17 years for the Royal Charter of 1739 which established Coram, formerly known as The Foundling Hospital – the first home to care for these vulnerable children. Sadly, today, still too many children and young people in the UK do not get the help and support they need and Thomas Coram’s work continues through the charity simply known now as Coram. Coram has ambitious plans for the future and with this building is starting to write the next chapter in its history. Upon arrival, The Queen was greeted by Isaac, aged 8, who found his adoptive family through Coram. Edward Newton, aged 102, and the oldest surviving pupil of the Foundling Hospital, was presented to the Queen. The occasion was particularly poignant for Mr. Newton who also met King George V and Queen Mary during their 1926 visit to the Foundling Hospital. Alongside Mr. Newton, Her Majesty also had the opportunity to meet one of the youngest children to be adopted through Coram, Mia, aged 14 months. 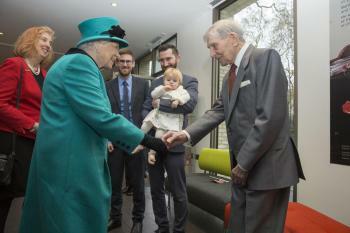 Her Majesty then met Lewis, aged 8, who found his adoptive parents after taking part in Coram Adoption Activity Day. His moving story was featured in the highly emotive Channel 4 documentary, Finding Me a Family. It is exactly a year to the day that the documentary aired and coincidentally it is also the day that Lewis moved in with his adoptive parents in time for Christmas. Lewis presented The Queen with a copy of the recently published children’s book Captain Coram: Children’s Champion which tells the story of the remarkable life and achievements of Thomas Coram. 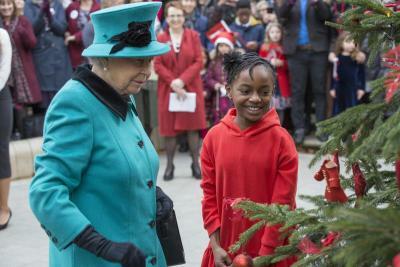 Before her departure, The Queen decorated Coram’s Christmas tree with a miniature Thomas Coram coat decoration, alongside Shylah, aged 8 and her mother Eve Clarke. As a young parent, Eve pioneered Coram’s Young Parenthood Programme, a peer-to-peer education scheme in London where young parents talk to pupils candidly about the impact of having a child at a young age. The Queen Elizabeth II Centre was made possible by the generous donations from a number of supporters led by The Queen’s Trust and ZVM Rangoonwala Foundation. Coram’s Children’s Rights Centre, integrating legal advice and information, legal representation, outreach and advocacy across education, immigration, community care and family law, securing access to justice for children and building civil society capacity to use legal means to fight for children. The Rangoonwala Conference and Learning Centre, supporting improved delivery of services seeking to drive systemic change and building capacity for the future through training, development and debate.